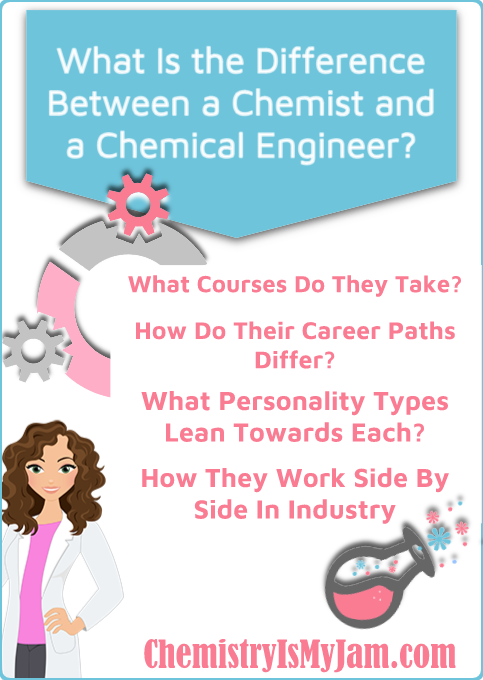 What is the Difference Between a Chemist and a Chemical Engineer? - Chemistry Is My Jam! Chemistry can be your jam too! What is the Difference Between a Chemist and a Chemical Engineer? The courses they take and the skills they learn. The differences in their career paths. How the two can work side by side in industry. Which personality types might enjoy each field. 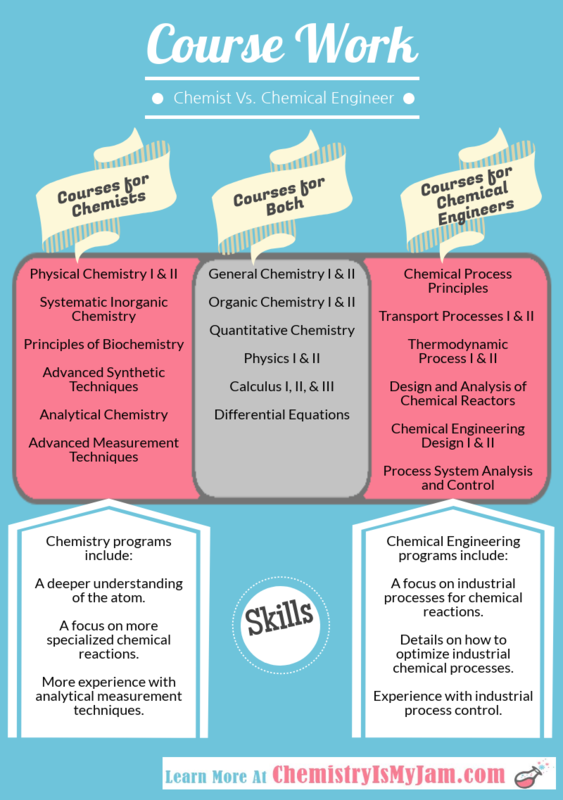 What Courses Do Chemists and Chemical Engineers Take? The first two years for the two programs are essentially the same. Both programs are hitting chemistry, calculus, and calculus based physics pretty hard. The chemist and the chemical engineer will go through two levels of general chemistry, two levels of organic chemistry, and quantitative chemistry. Their paths begin to diverge by the ocasional course in the sophomore year and then go very different directions for the junior and senior years. The chemist will go on to gain a much deeper understanding of physics of the atom. They will dive deeply into the theoretical side of their field and how to research it. An entire course is dedicated to analytical chemistry, meaning the instrumentation that separates, measures, and identifies chemical compounds. The chemical engineer is not as likely to need a deep understanding of the theories of the nucleus. Instead, they will need courses that prepare them to take the work of the chemist and apply it in an industrial setting. The chemical engineer will focus on how to design systems that will transfer fluids, maintain temperatures, mix materials, manage pH, and produce the desired products on a large scale. Think of it this way: in many cases the work of the chemist is on a smaller scale in a lab setting. The chemical engineer takes the processes developed by the chemist and scales them up to the level of mass production. Both of these are incredibly important roles! 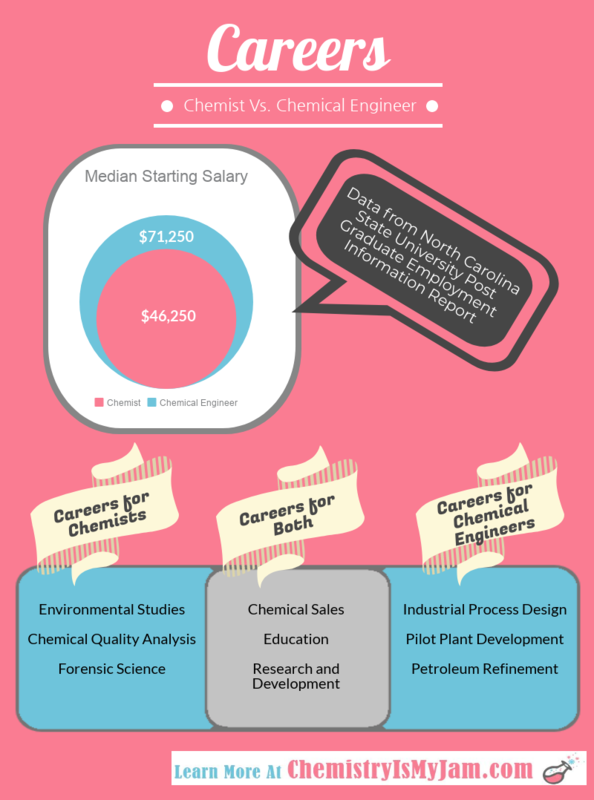 How Do Careers Compare for Chemists and Chemical Engineers? Before we jump too deeply into careers, I want to make a small disclaimer. This information is based totally on generalities. Both chemistry and chemical engineering are competitive fields that can follow some amazing career paths. Whichever path you chose, you’ll have an awesome degree. The world is your oyster! We will talk about money first – but keep in mind that money is not everything. NC State collects voluntary data from their graduates regarding job placement and salary. This report listed the median starting salary for chemical engineers as $71,000 and the median starting salary for chemists as $46,000. I’ll speculate a bit on why there is such a large difference. Part of it is due to who they go to work for. The chemist data is going to be skewed by the fact that many chemists go to work in research. Research sometimes gets a bad rap because people relate it to repetitiveness, but research is crucial to your way of life! The problem is that in some cases research is grant funded and unable to pay the big bucks. Chemical engineers, on the other hand, usually go to work for companies – companies who are producing products and bringing in profits. Companies who can afford to pay the big bucks. There are absolutely exceptions to this, but be aware that this skews the salary data. Another aspect to consider is the nature of the job. In many cases, chemists are sometimes in laboratory environments. This offers some level of consistency to their schedules. Chemical engineers are often working on a team that is producing a product. These are processes that run around the clock and are not always kind to a person’s personal schedule. This is an inconvenience that they are compensated for by an increase in salary. There are many careers that are very appropriate for both the chemist and the chemical engineer. Both would find a comfortable home in chemical sales or education. Research is often associated more with the chemist, but there are plenty of research fields where a chemical engineer could offer valuable insight. (Remember…still speaking in generalities.) There are some fields that tend to be more suited for the chemist. Environmental studies, product quality analysis, and forensic science are good examples. The chemical engineer, however, is more likely to find a career in industrial process design, pilot plant development, and petroleum refinement. In industrial settings, chemists and chemical engineers often work side by side to carry out different, but equally important roles. Consider the case of a company trying to develop a new chemical product. The initial reaction sequence would likely be developed in a laboratory environment by a chemist. The chemist would determine the best temperature conditions, the ideal solvent for the reaction, how to maximize the kinetics of the reaction, and how to drive the equilibrium of the reaction as far towards the products as possible. All of this information would be passed on to the chemical engineer, who would then design a pilot plant in an attempt to scale up the reaction. The chemist and the chemical engineer would work side by side in an attempt to optimize the reaction conditions – trying new ideas in the laboratory and taking successful ideas to the larger scale. As the desired products are produced, the chemist would run analytical tests to determine their purity and make suggestions for how to improve it’s quality. The chemical engineer would respond to these suggestions by trying different scenarios in the pilot plant. This is the scientific method in action! This process is repeated over and over until optimum conditions are achieved. This represents one scenario where chemists and chemical engineers work together. In reality, this is often a team of people each playing different roles in the process. What Personality Type Might Enjoy Being A Chemist? I’m going to start off with another disclaimer. These are total generalities! If what you’ve read above about the life of a chemist appeals to you and you enjoy the subject, I say go for it! The chemist often finds themselves in a laboratory environment. This brings some level of predictability to their schedule which many people appreciate. The life of a chemist often appeals to organized people who enjoy a consistent routine and don’t mind working alone or in small groups. Can you picture yourself in a cute lab coat with comfy closed toed shoes, a pair of safety goggles, and a pony tail. This is not uncommon attire for a chemist. What Personality Type Might Enjoy Being A Chemical Engineer? Chemical engineers often find themselves in industrial environments, which can be a bit dirtier and more unpredictable than a lab. The day to day life of a chemical engineer is going to depend on the reliability of the process they are working on. Some days are quiet as they attempt to tweak a beautifully running process. Other days are total chaos with broken ball bearings, chemical leaks, and failing pumps. This might appeal more to people who enjoy working in teams and don’t mind a wrench being occasionally tossed into their routine. Can you picture yourself in khakis, steel toed boots, safety goggles, ear plugs, and a hard hat? This is what an average day looks like for many chemical engineers. Two amazing career paths, each with their own set of challenges and rewards. Which one appeals to you? I’d love to hear about it in the comments or through one of my social media channels! « What Does My Final Exam Grade Have To Be? Excellent explanation! I wish more people knew the difference before they started. I saw many ChemE’s switch to other majors halfway through because they didn’t understand the career path when they started. Also, love the infographics! Keep it up! I totally agree with you. 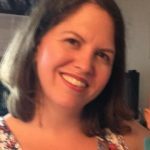 I really had no idea what I was getting into when I first started my engineering journey. Thank you so much for the kind words! This website does contain some affiliate links meaning I earn a small commission if you use those links. I only recommend brands that I use and trust.